One-sentence summary: After five boys are murdered, a band of villagers take their bodies to court to seek out justice, but face violent trials and tribulations along the way. Do I like the cover? : I adore it — love the woodcut style illustration and the feel, which perfectly captures the novel’s story. First line: In the end, I listen to my fear. Why did I get this book? : The setting and melancholy premise fascinated me. Review: Set in 1377, Sinful Folk follows a band of starving villagers who are pilgrimaging to court to plead for justice following the suspicious deaths of their sons. Five boys burned to death in a house, intentionally locked in by an unusual knot. The village, already facing a hard winter and impending famine, immediately suspects Jews as the culprits. The boys’ bereaved fathers gather the bodies of their sons and decide to keep them unburied to let the King witness their cruel deaths. Each villager, however, carries a dark secret with them, and on the road, beset by bloodthirsty knights and bands of murderous rogues, one twisted truth after another emerges. The deceptively simple premise belies a more complicated novel that hit every note right for me: wonderful evocation of setting & era, fascinating characters, dramatic plot, and surprising historic details. 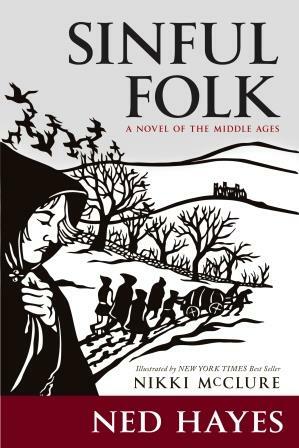 The grimy, wintry feel of the landscape is a character, too: with just a hint of air conditioning, I was shivering along with our travelers, my skin crawling at the everyday reality of life for a medieval peasant. Despite the dark premise, the novel reads quickly, with many exciting interludes, and I found myself racing through the story. Nikki McClure, the illustrator who did the cover design, provides small illustrated elements that open every few chapters, and they’re striking and interesting. My only complaint is that the historical note was really a brief piece about Edward the Black Prince rather than a larger essay touching on the other events that occurred in the novel. While the details about Edward were interesting, I am intensely curious to learn if some of the things that befell our travelers were historically true or wholly fictional. Recommended for fans of medieval fic as well as those who like stories of commoners (seriously, between the cold and the grime, I was esp grateful for my shower!). A great end-of-summer read, or one to save when facing a snowy weekend!